A few weeks ago a reader asked about tips on having a suit altered. As often happens, this came up in the comments to a post – some of the best information is in there! I always recommend having a suit altered of course, if you have bought it off the rack. A couple of small changes to the waist of the jacket or line of the trousers can make a huge difference to the overall look. In this hugely popular post from 2009 I went through how to buy a suit if you intend to have it altered, and then some possible alterations. Today, I want to run through some top tips on the process. Please add your own in the comments if I don’t cover them. The buttonholes on a sleeve are one of the biggest barriers to having a suit altered. If they are working buttonholes – so the cloth has been cut to allow the button through – then the sleeve can only be shortened or lengthened so much before it starts to look silly. The buttons either get too close to the end of the sleeve or too far away from it. This is why bespoke tailors, particularly Anderson & Sheppard, usually only had two of the buttonholes working. It meant you could alter the sleeve if you handed the jacket down to your son or nephew. Of course, you can alter the sleeve from the shoulder as well, but this is more expensive, harder (easier for a poor tailor to mess up), and impossible on checked jackets. So when you’re buying a suit to be altered, check whether all the buttonholes have been cut. Ideally, one or two of them won’t have been. And if there’s any chance of the suit being handed on, then leave one or two of them uncut. Having a suit altered is almost as difficult as commissioning a bespoke suit in terms of style. How narrow do you want the trousers? How short do you want the sleeves? An easy way to guide the tailor is to bring in a jacket you like the style of. They will get a good idea of the required measurements that way, or even why you think the sleeves are narrow, but aren’t that much. Perhaps the lapels seem too broad to you, but it’s more a question of the narrowness of the shoulder. Another good idea is just to remember the measurements you like, in numbers or short hand. I know the sleeves of a jacket should always stop at my wrist, for example, while the shirt stops at the base of my thumb. And my trouser measures are 1815 – 18-inch knee and 15-inch bottom. Not a difficult date to remember if you like your history. If you’re going to make any part of a suit bigger, you require inlay – the excess material on the inside of seams that allows them to be expanded. The amount of inlay varies surprisingly between suit brands. There’s no end to the ways brands will cut costs if they can, and getting rid of inlay is one of them. You wouldn’t think it saves any money, but on thousands of suits it does. Losing weight and having suits altered is great. It will make you look better as well as feel better. But don’t do too much. You can usually take four inches out of the waist of a jacket before it starts to fundamentally alter the look. Ideally it shouldn’t be more than two or three, but it will vary with styles. When considering how much the look of the jacket is being changed, run your eye up and down the side of the jacket – from shoulder, through waist, to the bottom of the skirt. That should be a smooth and elegantly flowing line. Get too much altered – or a too-sharp nip of the waist – and the line is ruined. Think about what is easiest to change. The waist of a pair of trousers is a lot more complicated than the legs. There are curved seams, there is lining, there are pockets that could look weird. Legs are just one long seam. You can follow the discussion on Five tips on suit alterations by entering your email address in the box below. You will then receive an email every time a new comment is added. These will also contain a link to a page where you can stop the alerts, and remove all of your related data from the site. Simon, one of the things I see so often is young men who’ve had their coat waists altered to become ridiculously tight like a corset. Fitted does not mean tight. If it’s touching your waist it’s tight. Especially the lower back. A warning: If a shop salesman pins the centre back seam (to shape the waist), run. I’ve seen this many times! The side seams shape the waist. The centre back seam is more complicated and best left to bespoke tailors. Avoid at all costs in rtw alterations. Simon, interesting point about A&S only have two working button holes. I can see how this would make it easier to lengthen the sleeves but presumably it wouldn’t make much of a difference if the sleeves needed to be shorten (assuming the working button holes were those closest to the end of the sleeve, unless the reduction in sleeve length was so extreme that those button holes could be chopped off entirely). I asked a Swiss tailor a RTW Purdey tweed jacket in regular (R) to shorten its sleeves (sleeve shirt length 31″). She removed its four buttons and justified cutting only one buttonhole and repositioned in distance of half the diameter of the one remaining button removed from the sleeve cuff edge by saying the sleeve fold ended too short for more buttons with buttonholes? ? I’m completely confused! Which two of four sleeve buttons get holes cut and why? But Simon that means the jacket sleeve, if shortened, MUST be shortened to AT LEAST a length BEYOND both cut buttonholes, exacter, BEYOND the higher of the two lower (the second from the lowest) buttonhole! Nothing between is possible! If the two upper of four buttons had their holes cut, again this would compel limitations to possible shirt length shortening. I really don’t understand why A&S does two buttonhole cuts. Apologies, I didn’t read the original question above before replying. Places like A&S only cut two buttonholes to make it easier to LENGTHEN the sleeve, not shorten it. It doesn’t help at all with shortening, but generally when you pass down a jacket to the next generation, they are more likely to have longer arms than you, rather than shorter. This is the point I have made above, at the beginning of this sub-thread. I can’t follow the English of ‘Reader’ above to understand what his question is. It should be noted that in many cases, the false stitching of non-functional buttonholes cannot be removed without leaving a mark. This depends partly on the cloth and partly on how dense the stitching is. More ! More of this sort of thing , please! For those of us who can only admire but not partake in bespoke this is the closest we get to actually doing what you write. Having recently , for the first time , had suit trousers tapered I found it can disturb the overall balance. For example having seen a ‘simple’ sleeve shortening being done I was surprised at the effort required. I thought I would comment on your point about trousers being tapered. Were they pinned on the side seam or the rear panel. I say this because I have had trousers before tapered and it does not look right (ok on jeans) what my tailor does now is pin and reshape the leg from the rear all the way down. Then takes them apart re-cuts and puts back together. This keeps the front flat and as it should be but slims down the legs from the rear to stop them sagging. This is done because I have quite a shallow rear and thighs. But maybe a solution for you too if you have had a problem with them being just tapered. This is much more difficult though and does require a very good tailor as you are effectively re cutting the pattern. Not to a bespoke standard but much closer to it in skill level required (my tailor ex ex Poole). And what you said about sleeves. I was shocked about how much goes into shortening a shirt sleeve or just narrowing them. I pay more for narrowing and shortening a sleeve than I do for the whole trouser thing mentioned above. Thanks Adam. I’m a bit confused though – you could only taper the legs by using the seams on the outside or the inside of the leg, surely? The bum could be altered with its central seam, but that would only alter that? Comments are making this seem more difficult than it is to actually do. Since I do alterations for menswear, particularly for anyone who does not have much of a rear end, essentially the rear waist to crotch seam is pinned to take out the excess fabric, the back waist to crotch seam is re-drawn, the inseams are opened knee to crotch to knee, the back of the inseam is pulled forward, sometimes as much as 2″, then the inseam is resewn, after which the crease down the back of the leg needs to be re-pressed, as it has been pulled forward by this operation. Difficult to describe without a drawing, but actually easy to do. Only rarely can a sleeve be shortened from the top end, as it usually tapers and is smaller in circumference than the armhole. Lengthening or shortening jacket sleeves with cut through buttonholes can be difficult if not impossible. Cheers to all! I would rather understand it better if there were the possibility for you to draw it? And perhaps send it to Simon? who in turn could post it? Simon? It is interesting, yes, and happy to post. However, I would generally go with Mac on this – such complicated alterations are usually worth avoiding. I’m sure Elva will do it well, but most will not. Shortening a sleeve from the shoulder needs a bit of arithmetic as the reduction at the sleeve head and underarm is not equal. It is quite easy to get about 1″ off the length. This is problematic as a method on patterned cloth, as what may be quite well matched before shortening will of not be afterwards. This may be completely off piste, but reading your advice about jacket sleeve lengths and the issues about buttons, I couldn’t help think what is the point of buttons on a jacket sleeve at all? I know they’re decorative but what purpose do they serve other than that? And is there any real purpose to having them fully functional? I have a number of bespoke suits and take a definite pleasure in knowing the button holes work as they should, but does anyone ever open them anymore? Or did they ever? They were originally used to open the sleeve of the jacket and fold it back, just as you would do with your shirt. They were sometimes called surgeon’s cuffs for that reason – so a surgeon could roll them back and not get blood etc on them. But no, no one uses them anymore. I do like them as an aesthetic detail though… It’s a nice change in texture to have horn on the cloth. A bit like hardware on a bag. A good alterations tailor will shorten the sleeves from the shoulder. A not so good alterations tailor would make a total hash of trying. Apologies, Simon. I’m fairly certain this has been asked and answered on another post, but I’ll be damned if I can find it. Good question. I must live with a one-button sleeve practically at the sleeve cuff’s edge because the tailor probably only does wpmen’s clothes. Ha. It’s now almost three years later, and I just stumbled on my old comment while seeking out the answer to the same question, about the very same sportcoat. I eventually had the job done by a laughably inept seamstress in Ulaanbaatar who butchered the cuffs of my jacket by simply folding over the hem and sewing the bulky, lumpen, unattractive arrangement in place, making the buttons non-functional in the process. I couldn’t bring myself to let it go so I’ve been carrying the jacket around the world with me since 2015, unworn, until tonight I pulled it out of the closet and decided to restore the original cuffs. I’ve spent the last three years learning my way around a needle and thread, so if I screw it up I only have myself to blame. Don’t bother with extensive alterations to a RTW garment. It’ll never pass for bespoke and you might even ruin it. Worth altering: waist or sleeve length on jkts. Waist, fork/seat or bottoms for the trousers. They’re the fundamentals of fit. Nobody will critcise you for wearing RTW, but they may laugh loudly if your sleeves are down to your knuckles! Surely the reason for altering a RTW is to get it to fit better, not to make it pass for bespoke!! A good alterations tailor would also be able to adjust bridles, shorten coat length, sleeve pitch etc as necessary to get a better fit. in case of RTW jackets with too long sleeves without buttonholes be content merely to have the sleeves shortened without buttonholes cut. A very practical post! I hope Incognito will take time to read it and the comments as well! This is an off topic question, Simon. I wonder whether it’s really worth buying the kind of unstructured Summer jackets usually made by Italians – Boglioli comes to my mind – which lack even the slightest free floating chest piece. Obviously, they seem suited to the Summer heat, especially when made in cotton. But would it be a good reason to skip a defining characteristic of a decent middle range jacket for mere suitability? Sort of following on.. Could I possibly trouble you for your option on this jacket.. I have just bought it.. (Bargain Mr porter price £430) I wanted your opinion on its versatility. I have seen it in person before and it has canvassed front piece but completely unlined and lightly Constructed. It’s not the mid grey blazer I was after but it is quite an open weave with white / light grey flecks. And very soft shoulders. I wanted it for chinos trousers and the smartest of jeans. It’s a shame there are 3 flap pockets instead of patch. I obviously have to get my Tailors opinion on the arms as I know they will be too long. (Thank god for Mr ps excellent return terms) But i wanted your opinion as I said on its versatility. It looks nice, and will be great with pale trousers particularly. Personally I wouldn’t wear it with jeans (it’s a bit too dark and not quite casual enough in the material) but smart chinos would be good. Thanks for this excellent article. I would like to suggest the following. Choose your alteration tailor well, after 5-6 attempts I finally found one of a good standard. The cost in getting there was high: many poor sleeve alterations and a few ruined suits and jackets (bad waist alterations). Another tip is try one garment at a time, then only one item will be ruined if they are no go good. Also on a first visit or on complicated alterations record what the finished measurements should be…then each party is covered should there be an unexpected outcome. Sleeves are a particular problem, Tom Ford now completes all jackets with an unfinished sleeve – in house tailors then cut to length and add shams and buttons, if only all jackets came this way! Altering at the shoulder, with a good tailor, will usually give a better result as many shams leave a mark after removal, particularly on fine cloth. As Inkster points out this is not recommended for checks etc. as the pattern then moves. For jacket/coat waist alterations beware of taking too much out of the rear side seam – it can shorten sleeve movement. For trouser waists, unless weight has dramatically altered it is best to err on the side of too big; heat, digestion, imbibing etc. can alter the waist in hours, always better to have some room for expansion, once altered and too tight the trousers will always be uncomfortable. Lastly wear appropriate items for the alteration – match a business shirt to a jacket to get correct sleeve length and look and for trouser shortening wear correct footwear; a business suit should have trousers that fall correctly over business shoes (not weekend trainers), a pair of jeans might best be cut to length with the boots often worn with them. This will give the tailor the opportunity to correctly and sympathetically match alterations to the best and most appropriate item. A good tailor should be prized (as with good mechanics and barbers), let them know of your hapiness on a job well done, they will appreciate it. Thank you very much for these additional invaluable pièces of advice!!!! I was wondering wether the waist on trousers could be lowered, too? And if so, to what extent this might be possible? Thanks! No easily Phil. You’re effectively recutting and remaking the trousers at that point too. That’s what I was warned by somebody – I believe it was the salesman or director at Oliver Brown – that shortening the jacket sleeve at the shoulder makes it tighter? I recently had my first bespoke suit made in Takahashi Tailor of Tokyo. They insisted I forego working cuff buttons, at least for the first suit, so the cuff buttons ended sewn on top of the (unopened) sleeve. They suggested I better wear my first suit for a while to make sure the sleeve length is right, before taking it back to cut the working button holes. I have no intentions of unbuttoning the outermost button to “show off” my working cuffs, so it’s not a big deal in terms of utility. It’s just that odd feeling of having “fake” buttons that are just for decoration, instead of authentic ones. Have you had any similar experience in the UK? Was hoping to ask you about getting rid of suits. Have checked around and there is no clear points I could find on this topic. I have 3 suits that are all Ermenegildo Zegna. They all have pleated trousers ($200/alteration) and one of them is a 3button that I need to have altered to 3roll2. Lastly, they are all striped – subtle, but striped nonetheless. Do I ditch the suits or get them altered? They all need to be taken in as well so total cost is going to be $350 – $400 / suit at my tailor. Hate to get rid of them but there might be so many strikes that it will be better. Sorry to impose this question, but curious to get your thoughts. Suits are in near perfect condition, but have these definite flaws I’ve mentioned. Thank you. 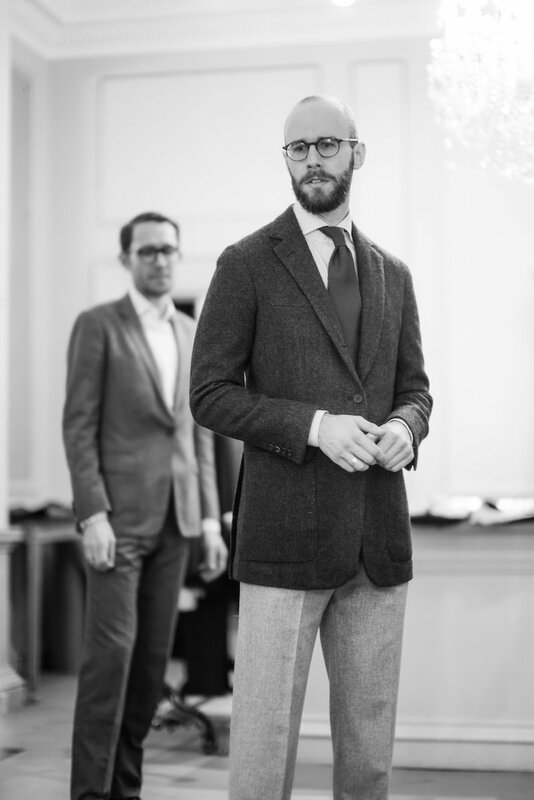 I am rather curious on your bespoke experience Will & team at Hardy Amies. When can we expect a more in-depth appreciation? No time unfortunately. They have now discontinued the service in tried…. You say that one should go for the pair of trousers that fits on the waist because the alterations to fit on the legs are easier. 1. I do not understand where exactly these alterations have to be best made to fit on the legs. Is it on the one long outer-seam (here I believe there is going to be a problem with the front pockets namely the opening is going to become smaller plus this will move the fold of the leg to the outer side) or on the inner-seam (crotch and downwards, which will move the fold to the inner) or on both of them? 2. Is it not easier to go for the pair that fits on the legs and then let the waist out? Are there then the pockets which were standing out flattened? 3. I am having currently a few pairs of trousers that need to be altered on the waist and on the legs (thigh) because I have lost some weight and because I want the hems slimmer (hem from 46cm to 40cm). How do you think this can be done? 4. Someone told me once that if I take the waist of a pair of trousers in then the pockets will stand unflattering out of the body. In this regard how should trousers fit? Thanks for your answers Simon. I understand that it is not easy to explain briefly in text, nor is your point explaining alterations. Certainly I am addressing alterations on one size bigger. But Following might help me as well. will flattening the pockets as well when led out on the waist? Thanks to you as always for your excellent advice and information. I’m struggling to find a good alterations tailor in London. Are you still using Graham Browne, Atelier Colpani or someone else? Is there a alterations tailor that you can suggest in central London? Anyone in soho or mayfair? Would be highly useful! Even if someone you haven’t used, someone that you have heard of? Can you recommend a good alterations tailor in central London. I bought a Belvest off the peck suit that needs a few alternations. I bought a very nice second hand wool-cashmere blend suit (from eBay of all places) with working button holed sleeves (“surgeons cuffs” as I’ve heard said). Fortunately I found a tailor who did a very nice job of shortening them at the shoulder. It was pricey of course, but overall worth it for this suit! I just got a suit that I love the cut and feel of, but need the arm length altered. I want to preserve the look and cut of the sleeve cuff (which has a tapered finish) so I am looking to have it altered at the shoulder. I have asked for it to the done (reattached) by hand? Do you think this is necessary? What the difference between having it done by hand or machine. Does sewing it by hand help with setting it as perfect as possible? I have read stories on various blogs discouraging people from shortening sleeves by the shoulder because it is very tricky and needs a lot of skill. I can’t see any other way to do it without changing the look of the cuffs.. Do you have any recommendations? Your advice would be greatly appreciated. It is hard, and you have to accept some risk in doing it. And yes it is generally better if done by hand, but I wouldn’t press the issue. The important thing is they are happy are comfortable to do it from the shoulder. But I cannot imagine a tailor or seamstress would not be “happy” to shorten a jacket sleeve at the shoulder? You write the width or breadth of the jacket shoulder has priority over the jacket waist. My girlfriend advises me since I got fat around my waist (now I buy 36″ waist cotton trousers knowing they will shrink) to buy jacket size 40 instead of 38. Yes, it’s true the single vent behind doesn’t spread and the closing button in front isn’t in danger of popping and stress creases/folds radiating out from the closed button don’t arise with 40, but maybe the shoulder width/breadth is more? Is it true that you cannot lengthen trousers with turn ups? This sounds like a lovely idea, but it would be hard to adjust the shoulders in this manner. It would depend on how the shoulders had been made originally, and whether any marking would be evident once they were changed, given their age. I would suggest talking to a tailor about it, but not hope too much. Also bear in mind that other things create that Italian look, such as width of the shoulder, and that is even harder to change. The waist, on the other hand, should be a cinch. Hi Simon, I think that’s a good idea. Apart from taking in the waist, do you think a tailor could probably do would be to reduce the shoulder padding a bit? Would that be feasible, do you think? Thanks, David. Thanks again Simon, I’m sure it will be all of that! I’ll see what a tailor says and go from there. David, the first time I phone Gieves & Hawkes in my life several years ago the saleman on the phone emphasized the roped shoulder of the G&H jackets, which you want to extract. Hi Peter, it must seem counter intuitive and strange. But remember, G&H are bespoke Saville Row tailors; what I’m talking about are RTW tweed blazers from the 1980s, and they’re not really comparable. I wouldn’t mess with something of Saville Row quality. The shoulders of a SR suit are, I’m sure, quite lovely. But in these pieces, the combination of large shoulder pads and the roped shoulders makes for a style that isn’t exactly what I like nowadays. I already have six suits with a more Northern European shoulder, and am curious about something with a more Italian, softer shoulder. But, I think that I’ll probably have to leave these sports jackets as they are, adjust the waist, and perhaps reduce the shoulder padding a bit if the tailor thinks it’s possible. Thanks for your help, David. Do you have any experience altering back centre vent versus side vents? I just bought a vintage harris tweed jacket made by Chester Barrie for Harrods from the 80s which has . It fits perfectly on the shoulders, sleeve length, and jacket length/blance is perfect. However, the waist was too wide and so it was very “boxy”. My tailor is taking in the side seams but stopping above the vents in order to stop the lower parts of the vents flaring out/gaping. Some advise only taking in the centre seem if there is side vents, but my tailor feels this distorts the jacket. I have gone with his advice and look forward to the result. Do you have any experience or thoughts on this? I think that makes sense – taking in the centre vent can be a little distortionary. I’d also advise generally against trying to take it too far and beyond the original style of the jacket. These days man “off the rack” men’s clothes come in small, Medium, Large etc. I’m 172 cm 5’8″ and ideally I’m a 42 short. However finding someone who stocks short fittings is becoming harder. I get annoyed when I’m told “we can shorten it for you”. A jacket that is too long in the first place has the button and waist too low for my body, so when they shorten the bottom of the jacket and the sleeves, it still doesn’t fit as it should, despite all their assurances. Shorten sleeves from the cuff, when the buttons indicate it should be done from the sleeve to me is wrong, and this jacket had a slight check in the pattern so altering the sleeve at the shoulder is fraught with difficulties. Shortening the bottom of the jacket can put the pockets a little out of balance. I recently saw a jacket I liked it was $900 and although they had a ‘short’ fitting is a few sizes not mine, and for the sake of a sale they tried to convince me that they could alter it. For $900 I’d rather get one that fitted perfectly in the first place. Hi Simon, I just bought a casual RTW summer sports jacket (100 % cotton, only the sleeves are lined). The sleeves need to be raised probably an inch. It has three buttons (working buttons, aping bespoke), and they’re fairly close to the cuff. It probably needs alteration at the sleeve head, would you think, which is pricey (the price quoted by the tailor that Drake’s uses in New York is $120 for alterations at the sleeve head, which is half the price of the jacket.) I hit upon a solution: since it’s a JCrew variation on the French chore jacket, I think that perhaps it could do without sleeve buttons entirely. I was interested in that interpretation of the ultra knock-about summer jacket, which might make sleeve buttons superfluous. Thanks, David. Hi Simon, you and the tailor I consulted are right – one would have to shorten too much; the only way is to shorten at the sleeve head. I’ll return this one and live to fight another day, and will be wary of sleeve issues in future. Thanks! David. The sleeves were cut a bit too short on a couple of my sport coats. My mistake – I insisted that the tailors do it this way. Nothing tragic, just by a half inch or so. Now, the sleeves tend to ride up (more so when they’re not freshly pressed, given that the fabric is a wool-linen mix). Could the jacket sleeves be lengthened? They have working cuffs so I guess the only option would be from the shoulder. Not sure if there is enough extra material – although the tailor said there is (he said the jackets could easily be let out in case I gained weight, so he was likely referring to the waist area). Should I bother with what seems to be a complicated/expensive operation? It’s likely the sleeves can be lengthened, yes, particularly if the tailor said so. But you’re right it’s complicated to do. It depends how much it matters to you – perhaps a good way to gauge that, is whether having the wrong sleeve length puts you off wearing them completely? Do you have any recommendations on where to get a jacket altered in London. Had a made to measure jacket done but the collar sits back from the shirt leaving a gap. I think this is likely to be quite a challenging alteration and needs an expert tailor to do it. Do the tailors on Saville Row do alterations (I would be embarrassed to ask them to alter a made to measure suit!). Many thanks for your thoughts. No, they won’t alter other people’s work. I had a dinner suit made with flapped pockets last year. In hindsight, I should have chosen jetted pockets. Is this something that is easy to alter to produce a good finish? Yes, it should be. At the very least, if they are well made the flaps should tuck into the pockets and be almost unnoticeable. Then you could just baste them closed. But a tailor might also be able to take them off. Are there any ways to alter a shirt? I have a bunch of bespoke shirts from Luca and Turnbull. I’ve gotten a bit broader in my chest from working out over the years. Would adjusting the darts help? Or would that only change the waist? Hi Simon, I had a suit made by biagio granata. Not happy and its really too tight (high) into the armpits and across the back in between my shoulders. So much so that it actually makes the cloth fold over the collar slightly. I’m sure you understand what i mean. Originally he promised to be coming back in Jun, but now he is only coming on 20July. Quite frankly im a bit fed up of the whole process, it started in Aug2017 and nearly a year later and its just been really tiresome. I guess this is the downside of visiting tailors from abroad. Question, shall i just take this to Graham Browne to get sorted? Is it the kind of thing they can do and somehow will I finish up with a suit that still has balance a proportions etc..
Oh dear. I know others have had similar issues as well. Failing that and assuming it is the kind of thing that can be done by Graham Browne, do you think its a sensible option to ask them ? Just bought my first sport coat from (NM Online, Ermenegildo Zegna), there are no sleeve buttons. What am I supposed to do with them? It would be funny if it wasn’t so sad that I have to ask. is it possible to replace the collar of a jacket or overcoat? Meaning is it something easy to do for a tailor or will he hate me for that? I would like to ask my tailor to replace the collar of an overcoat he made for me with a collar more broad. Only the collar no changes at the lapels. good to know that it can be replaced when worn out. The particular overcoat i want to modify has the type of collar which is narrower than the lapel. And the lapel itself is horizontal at the top, like on your Cifonelli navy-cashmere overcoat. It seems to me that it would be much more or at least equally harmonic if the collar had the same broadness like the lapel. I would not change the height or opening of the collar, just width of the collar. Besides i believe that it would take out some of the formality it has right now plus it would add some warmth. Sleeves should always be altered at the shoulder never at the cuff it will spoil the sleeve’s cut, I do not hold with all the rubbish I’m told about shorting a sleeve at the cuff, it is only because most haven’t the skill to do a proper job so opt for the easier option. I once took in a jacket to have altered, started with four buttons, ended up with one, I will never just trust these so called Tailors again, and always ask, How do you do it? And walk if I get the wrong answer. Thanks. I agree on altering from the shoulder if the tailor can, but how does shortening from the cuff spoil the sleeve’s cut, if the buttons are unaffected (either because they are not working ones or because the alteration is small enough)? I’m not too sure how this thing works but I feel so strong about this issue I feel I must have a say, I’m fed up being told by mostly woman No it has to be altered at the cuff I have had training. at the cuff the sleeve is usually straight then bellows at the elbow? if it is cut at the cuff as mine was I could see the shape was destroyed and I lost three buttons ending up with only one, I gave the new jacket away after that, now I ask where do you alter from? If I get the wrong answer I walk. No point in some long drawn out correspondence on this one. I know what I’m talking about. when is altering the sleeve length from the shoulder not possible? Given of course a skilled tailor. I could imagine that it might be more difficult at a shirt shoulder because of that stitching of the shoulder fold also on the face of the shoulder. I don’t know. My first three bespoke Jackets need actually some sleeve shortening. They are a bit longer, because back then i was wearing my shirt cuffs pretty wide. I think you also mentioned somewhere having a similar issue. And because of functional buttoning the only solution is from the shoulder. I never really went with that wish to my tailor, but, i still remember how his blood pressure raised when i asked him once, ‘theoretically’ of course, if shortening from the shoulders is an option. By the way, it is the tailor who made the jackets and which i still visit for most of my commissions. Now that i am more confident that the sleeves need to be shortened i am planing to go and ask him for it. That’s why i would like to know when it is not possible. Not that i am insisting on something not possible. Believe me i can fully understand any tailor not wanting to change anything on something they have made. It is something like an offence for them. I don|t know if there is a solution with some kind of gauntlet cuffs, besides from the shoulders. It’s just something that’s a lot of work, particularly compared to doing it from the cuffs. Your tailor might not want to do it or charge for it, for that reason. i fully agree with you, i also would not let another tailor do an alteration on the shoulders. And certainly is it something the tailor can charge for.